» Reviewed by David Vineyard: BARRY PEROWNE – Raffles Revisited, The Adventures of a Famous Gentleman Crook. 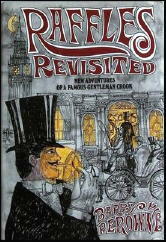 Reviewed by David Vineyard: BARRY PEROWNE – Raffles Revisited, The Adventures of a Famous Gentleman Crook. BARRY PEROWNE – Raffles Revisited, The Adventures of a Famous Gentleman Crook. Harper & Row, hardcover, 1974. Hamish Hamilton, UK, hardcover, 1974. E. W. Hornung only wrote three collections of short stories about amateur cracksman A.J. Raffles, and a disappointing novel (Mr. Justice Raffles), so in 1932 Montague Haydon, editor of the British magazine Thriller had the bright idea of continuing the character. He approached Leslie Charteris, creator of the Saint, who turned him down, and next the turned to Philip Atkey, Australian nephew of writer Bertram Atkey, who had already continued his uncle’s popular tales of cracksman Smiler Bunn. Writing as Barry Perowne, Atkey updated Raffles to the 1930’s and involved him in adventures along the lines of the Saint and other durable desperadoes from Thriller. The writing was good, and the tales enjoyable, but the war and the paper shortage ended both Thriller and Raffles. In 1950 Perowne had the bright idea of bringing Raffles back yet again, but this time in his original form, in short stories set in the original period and milieu. Raffles, the gentleman cricketer of the M.C.C. (Marlebone Cricket Club) and the Albany and his pal Bunny Manders were back and in the opinion of many if some of Hornung’s atmosphere and decadence are gone the writing and the plots have improved no end. The new stories appeared in Ellery Queen’s Mystery Magazine, The Saint Mystery Magazine, and John Bull. They were an immediate critical and popular hit. In addition Perowne gave the perpetually dumb Bunny half a brain, a device that helped the stories no end, and added Raffles sister Dinah to the mix. Raffles and Bunny foil a German spy ring, thanks to a dog that doesn’t know its master and a master who doesn’t know his dog, and Raffles is offended by a bribe. Raffles employs a mummy case to crack a safety deposit box in a bank and comes close to suffocating, save for fast thinking by the fence Ivor Kern and Bunny’s ability to read hieroglyphics. Raffles plays cupid while coveting a rare chess set. In Paris Raffles finds himself cracking a safe for a Parisian policeman in front of a room full of witnesses — and still gets the swag. A cricket game at the prison uncovers an attempt to break in to Dartmoor, and a secret that turns a profit for Raffles. On a cruise Raffles and Bunny have to aid an old classmate set up as the fall guy in an international con game involving phony diamonds. Raffles breaks his oath to never rob a house he is a guest in to steal a ship’s figurehead and unite a pair of lovers by framing an innocent man. Raffles eludes the police by setting them to solve a murder that never happened. Raffles foils the Anniversary Thief. Raffles meets his American compliment and aids the Knickerbocker Kid in reform and romance, all to win a wager on who will be chosen the Coffee Queen. Raffles postpones lifting a fortune in jade to help a houseful of young ladies named after the days of the week. Raffles has to rob a safe that is only out of sight for a few minutes every day. Raffles becomes the envoy for his old school chum the Royal Governor of Gibraltar in order to help the husband of a charming and innocent con woman escape from a heavily guarded ship carrying gold bullion. While Raffles is in Australia Bunny discovers his sister is more than blood ken to the master cracksman. Later books in the series, Raffles of the Albany, and Raffles of the M.C.C. add a new twist to the stories with Raffles meeting historical personages like Winston Churchill (“The Baffling of Oom Paul”), Conan Doyle (“The Victory Match”), Oscar Wilde (“Dinah Raffles and Oscar Wilde”), and P.G. Wodehouse (“The Graves of Acadame”) among others. With the possible exception of August Dereleth’s Solar Pons stories, the Raffles pastiche are unique in that they established their own fan base beyond the original stories. I’ll confess I find them superior to Hornung in terms of plot and writing, and believe they stand alone as some of the most entertaining stories of their kind ever penned. Perowne is not the only author to continue Raffles adventures. John Kendrick Bangs wrote a series featuring Mrs. Raffles and another with the son of Sherlock Holmes and Raffles daughter, Raffles Holmes. Graham Greene penned a play, The Return of A.J. Raffles, and Alan Moore recently included Raffles as one of The League of Extraordinary Gentleman graphic novels. David Fletcher, creator of the British television series Raffles with Anthony Valentine wrote a novelization of the eleven stories in the series. The Perowne stories are well worth discovering even if you don’t care for the originals by Hornung. Perowne’s version of Raffles and Bunny are a charming pair of rogues who manage the balancing act of a career in crime while never endangering their standing as English Gentlemen or Raffle’s standing as England’s finest cricketer. How they manage that feat is a constant source of entertainment in probably the finest series of pastiche ever written. There other Raffles pastiches and continuations. I enjoyed Peter Tremayne’s The Return of Raffles (1981) and have read John Hall’s The Armagh Emeralds (2004, 8 short stories of which “The Maharajah’s Jewels” is a clever reworking of Hornung’s “The Chest of Silver”. Still on my to-be-read-soon list are the Raffles and the Match-Fixing Syndicate by Adam Corres, an updating, and Raffles: The Complete Innings by Richard Foreman, six short stories. Raffles also makes appearances in Black Coats Press Tales of the Shadowmen anthologies, and of course I would never mention that just because my Arsene Lupin and Nyctalope pastiche appear in four of them and two others. I believe I have this book, but if so it’s stored away in a box that never got catalogued. It’s the cover that seems familiar, not the stories, which sound very very interesting. Perowne, an Australian originally if I recall, had some success in England with the Raffles Thriller series and a few stand alone novels in the adventure thriller mode. He’s a good writer, and quite a few critics, including if memory serves Boucher and Carr, preferred his Raffles stories to Hornung. Certainly his Raffles is the more charming of the two. His best known novel was They Hang Them in Gibraltar, a Raffles novel I believe. Just a note on the David Fletcher novel Raffles. Several critics made absolute asses of themselves praising the book when it turned out to be nothing more than turning Hornung’s shorts into an episodic novel, and despite being published here in hardcover was only a novelization of a television series. I found it entertaining and applaud the achievement, but when those things came out there were some very annoyed critics including The New York Times Book Review which was particularly effusive.